When you give your calendar to someone, it’s your ad that stays in their office for 365 days- without any charge! While brochures are once seen and then discarded, a calendar stays there for one complete year. 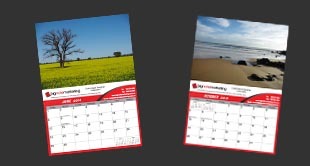 Now custom calendars can be produced and distributed as a cost effective advertising method. A calendar completely customised to reflect your brand and image is the ideal way to promote Your Brand - Your Way. Keeping your message in front of your prospects can be a constant and costly battle. Now you can put your products and brand right in front of them, for a year, at less than stock calendar prices. Your Ad on Display for 365 Days! Not just a Gift - but a Powerful Marketing Tool! While brochures are discarded, calendars are used and keep advertising your brand all year. With customized calendars from Big Note Marketing, you can showcase your brand for 365 days while subtly building customer trust in your abilities. A calendar is perhaps the most powerful way of offline advertising. Which other printed media offers continuous display for 365 days? Get a customized calendar and showcase your brand to prospective clients. As we are not just selling you a pre-printed calendar, but designing a calendar just for you, we would like the time to present and refine your calendar so that it is just that, Your Calendar! Your Brand - Your Images - Your Design.